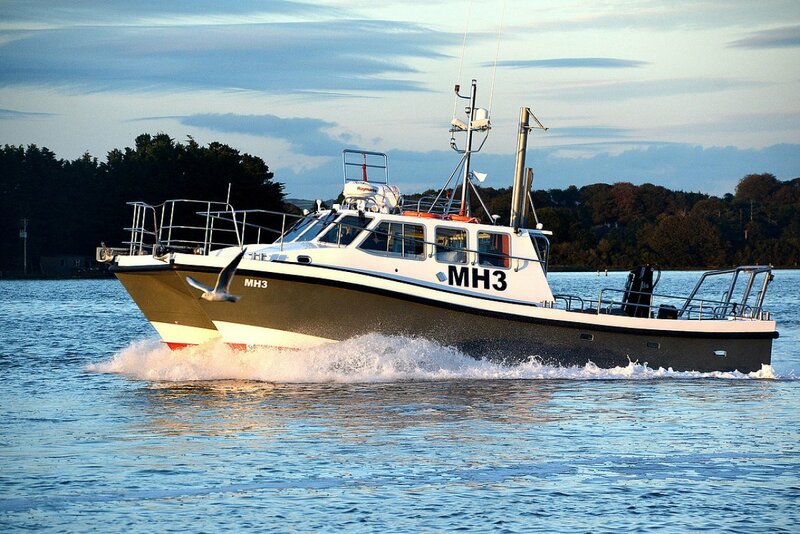 The WILDCAT 40 11.7m, high buoyancy, symmetrical hull catamaran, designed to offer a large stable work platform in an attractive, graceful design, combining style and good looks with practical functionality, a rare combination today. 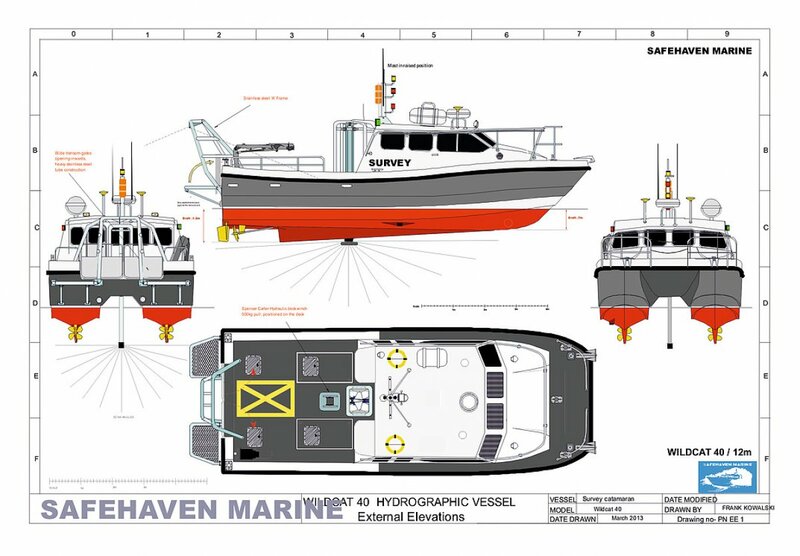 With a length overall of 12m / 40ft and a beam of 15ft the vessels hulls have been designed to provide high buoyancy in the fwd sections to prevent slamming on the bridge deck, which itself is raised as high as practical above the WL The hulls are designed to develop a spray cushion, softening the ride at speed. 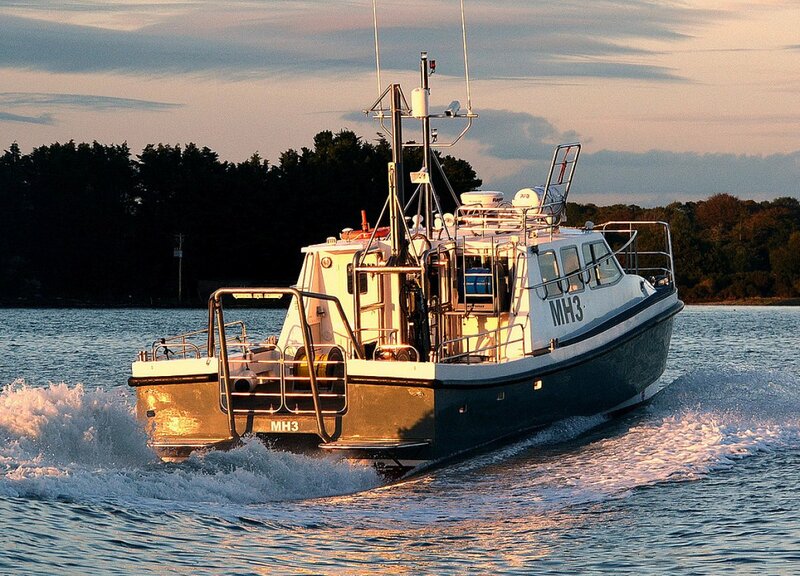 Full length keels are incorporated, and provide protection to the propellers, as well as increasing the hulls grip on the water for slow drift speeds. 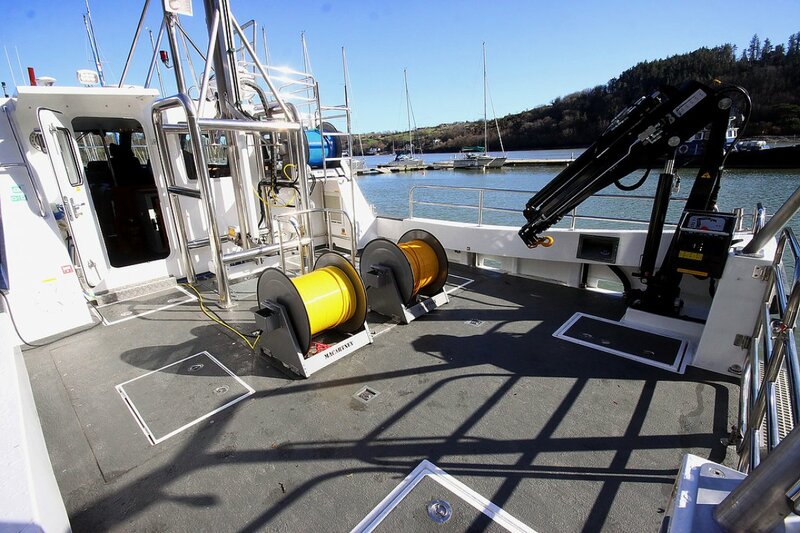 The vessels beam has been constrained to a wide 15ft 5" providing a good compromise between work area, stability, and minimal slamming that tends occurs on catamarans that have a very wide bridge deck. 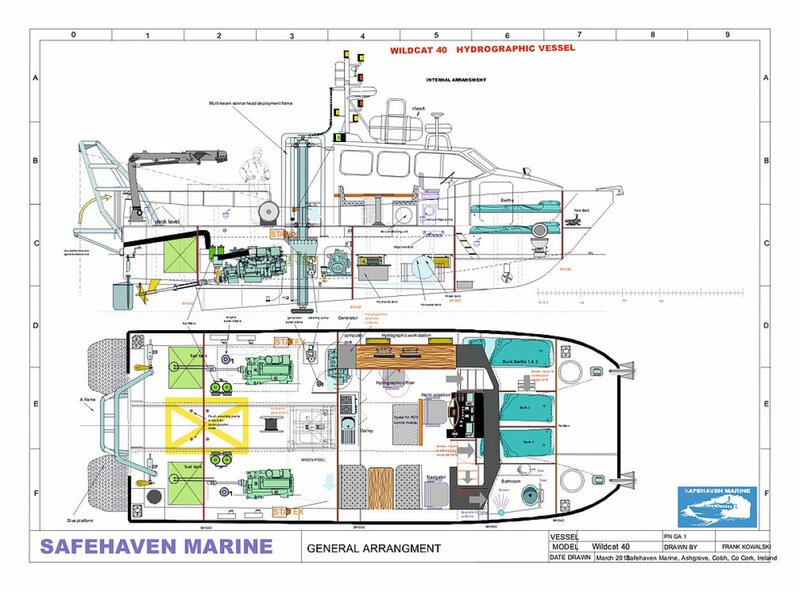 Also marina space and berthing facilities are considered, where excessive beam can be hard to facilitate. 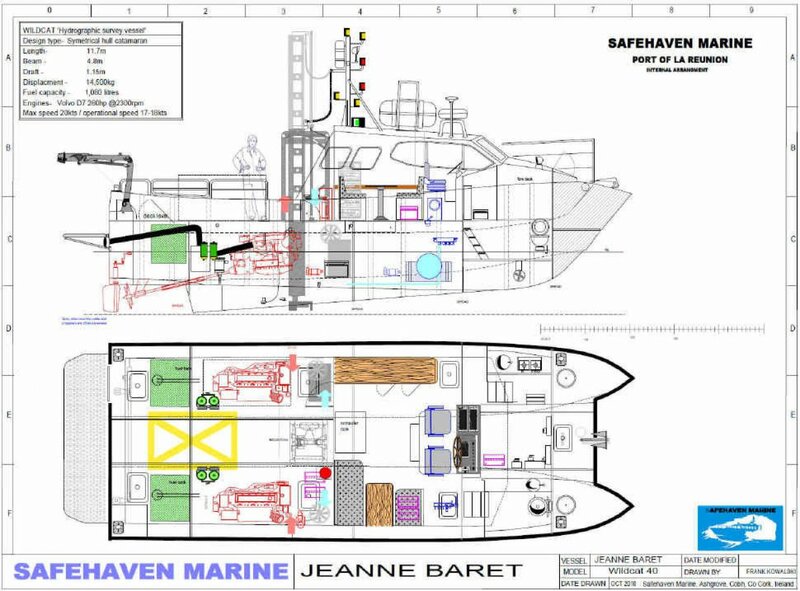 The superstructure design is full with maximizing internal accommodation area, yet providing a large and spacious flush aft deck, with the engines accessed from large opening flush hatches, providing excellent accessibility to the engines for service. 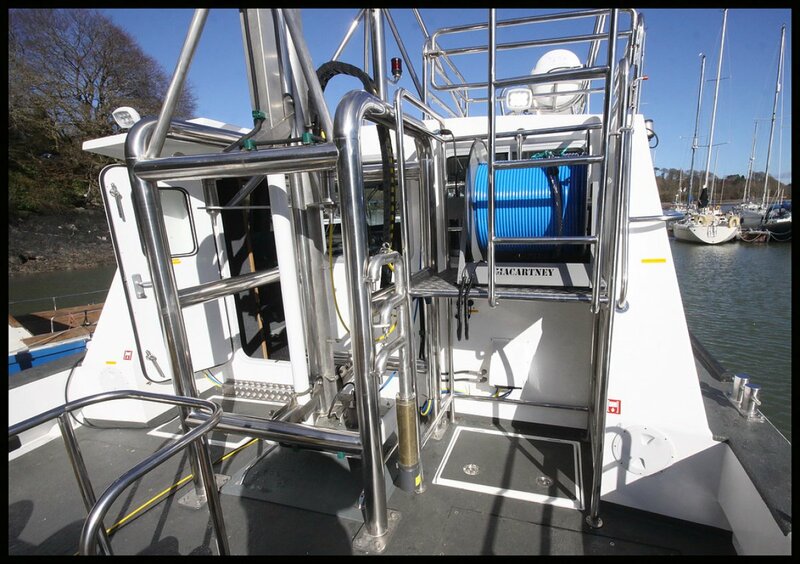 The catamaran design has of course very high levels of survivability with 8 individual watertight compartments. 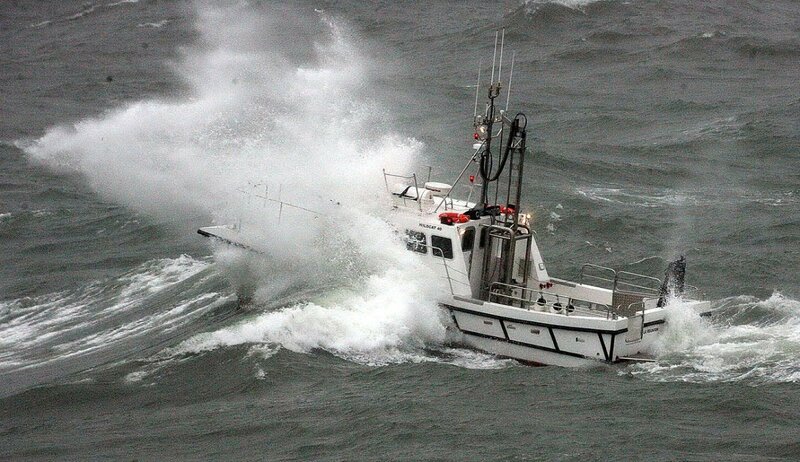 Due to the slender nature of the hulls, in choppy conditions vertical accelerations are much reduced in comparison with mono hulls giving a gentle ride and motion. 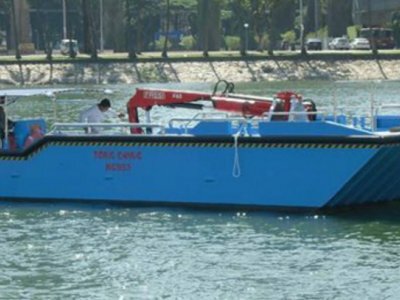 However previously the biggest disadvantage of the older type of catamaran hull which featured very fine sections fwd with little reserve buoyancy, giving a very smooth ride in short sea states but suffering badly in ocean swell conditions due to slamming on the bridge deck. 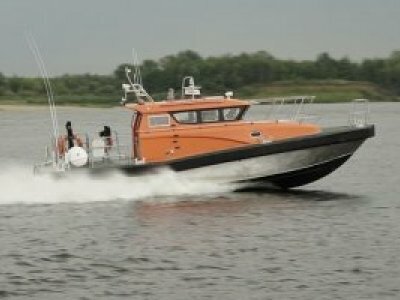 This shortcoming has been solved with much fuller fwd sections and much greater buoyancy, giving the hull the necessary lift to prevent slamming on the bridge deck, allowing higher speeds to be maintained into larger ocean swells. 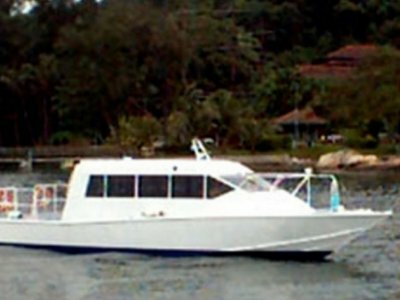 Due to the low resistance of the slender catamaran hulls, performance is excellent, especially at moderate speeds up to 20kts. Typically, horse power requirements are lower than in a similar sized mono hull. 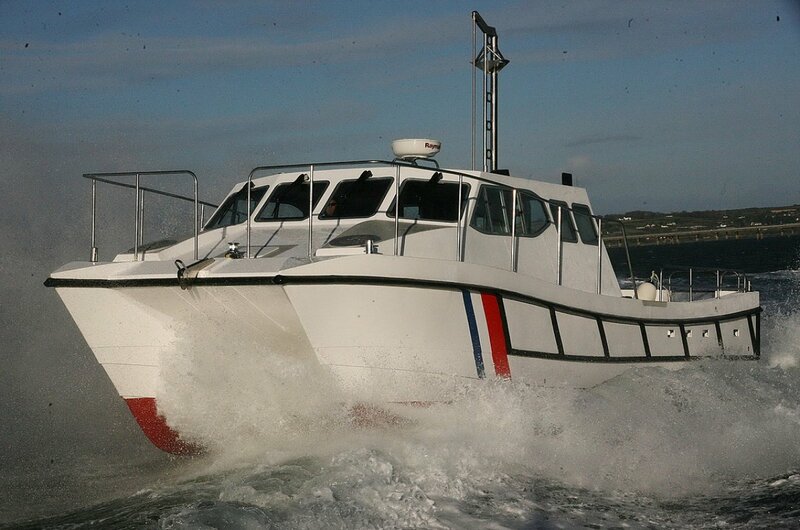 Furthermore, the flat running angles of the catamaran hulls, with no hump to overcome means that there is a wide range of economical speeds, incurring no penalty in fuel consumption at transition speeds often dictated by weather conditions. 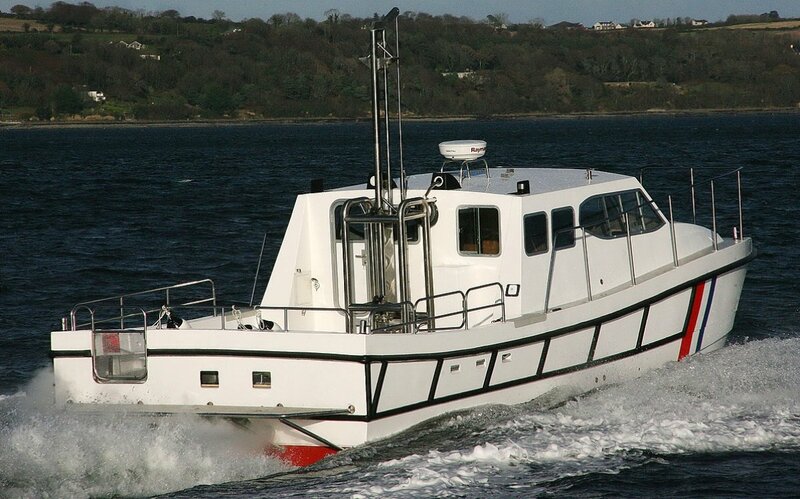 Probably the greatest benefit of the catamaran hull form over the monohull is its transverse static and dynamic stability. 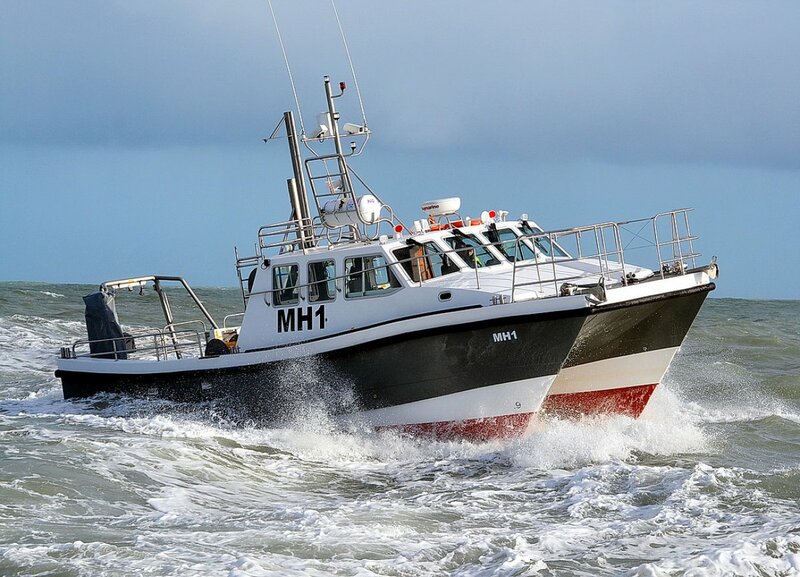 With GM figures typically 3-4 times greater than a similar sized mono hull the operational envelope in rough weather is extended. 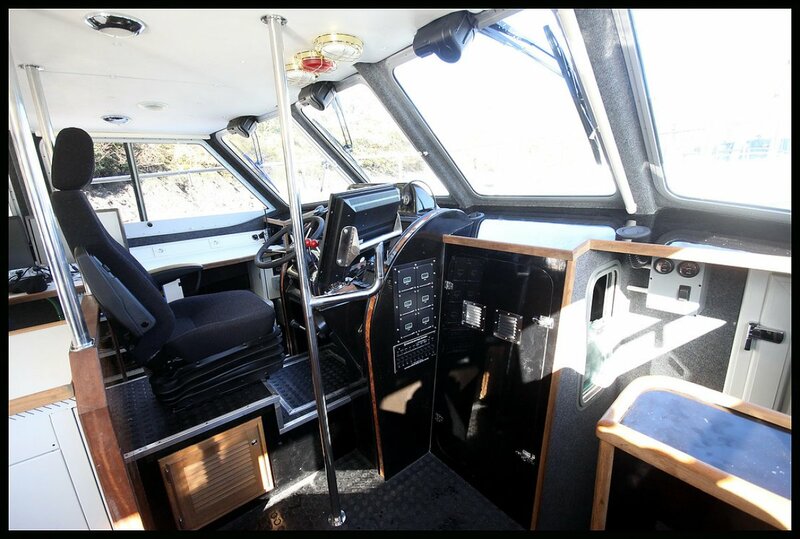 The Catamaran is able to provide a much more stable work platform at rest than a monohull with greatly reduced rolling and motion. In extreme conditions they are often the safest due to their great transverse stability. 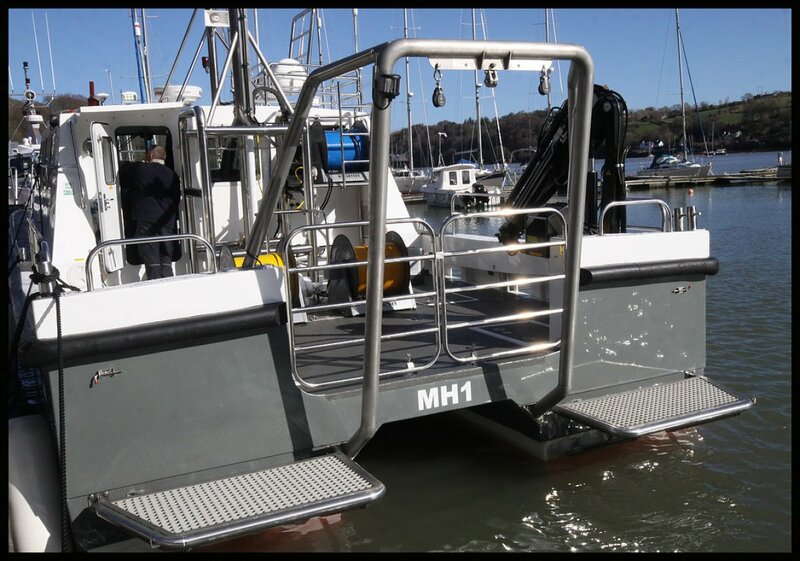 The main accommodation on the Wildcat 40 is fully customizable, typically on a hydrographic vessel it will incorporate a central helm position with alongside seating for the hydrographical equipment operator / navigator and provides panoramic vision all round with all the electronic navigation and hydrographic displays situated in a large console. 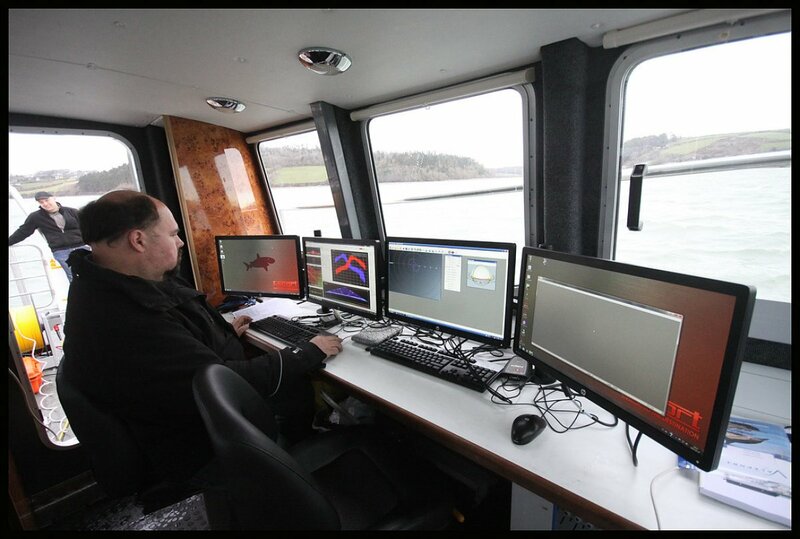 A work bench is fitted to the port side of the cabin stretching its full length, all the computers for the hydrograpic equipment are stored in a vertical rack / cabinet fitted at the aft of the cabin. 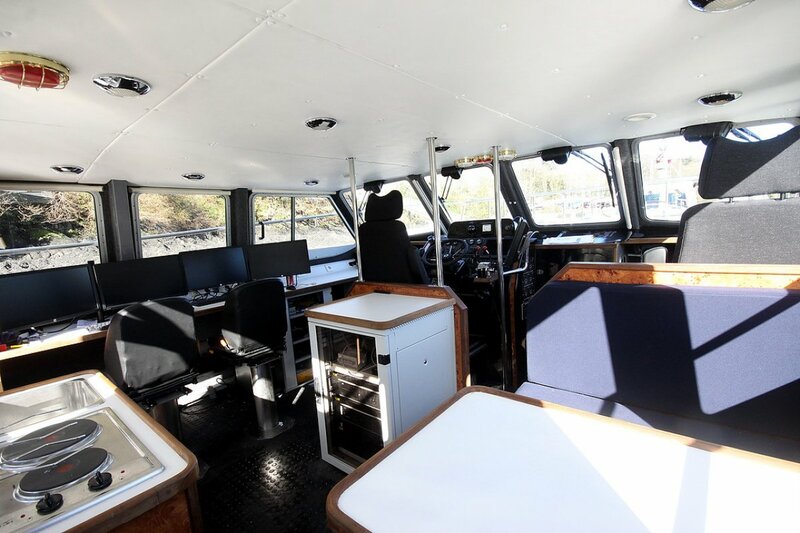 To port is a large dinette seating area with a table between. 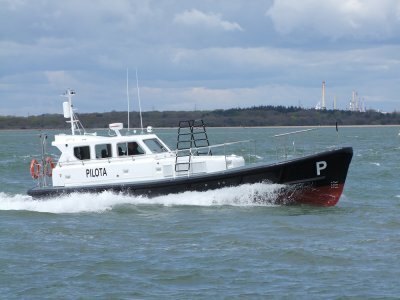 In the st/bd hull is a large heads compartment which is fully lined in white Formica fitted with an electric toilet and sink. 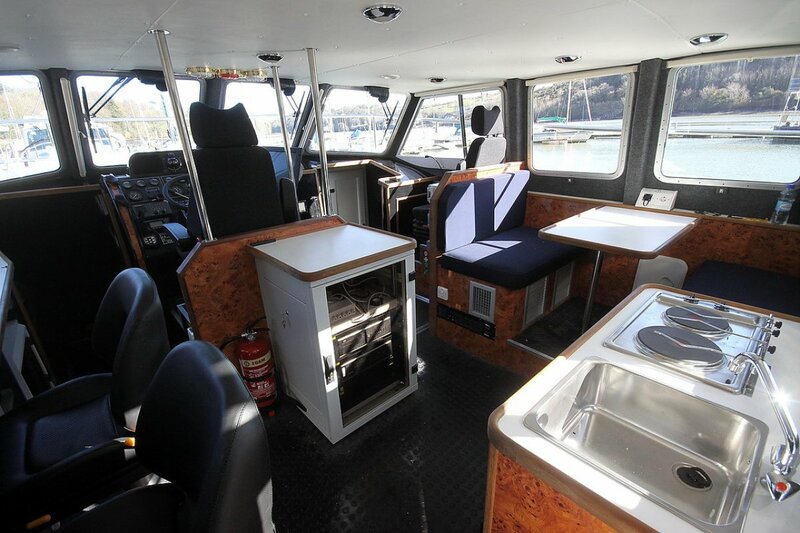 In the port hull f/wd is a full galley with 240v hob, sink, fridge and storage lockers. 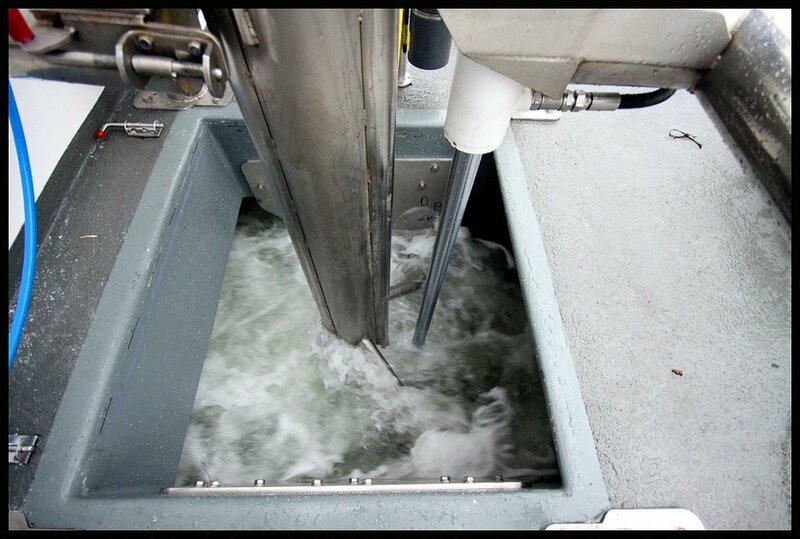 Onboard electrical power is from a 10kw 240v generator supplying multiple sockets throughout the vessel. 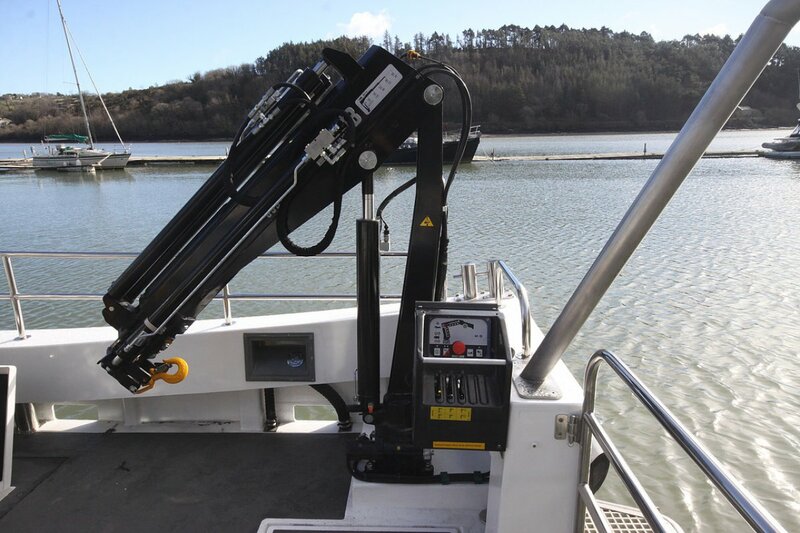 Other equipment can include a 1500W electric capstan, Electric 95kgf bow thruster, Electro hydraulic 013T HIAB crane, Dive platform, security alarm system and a full compliment of navigation equipment. 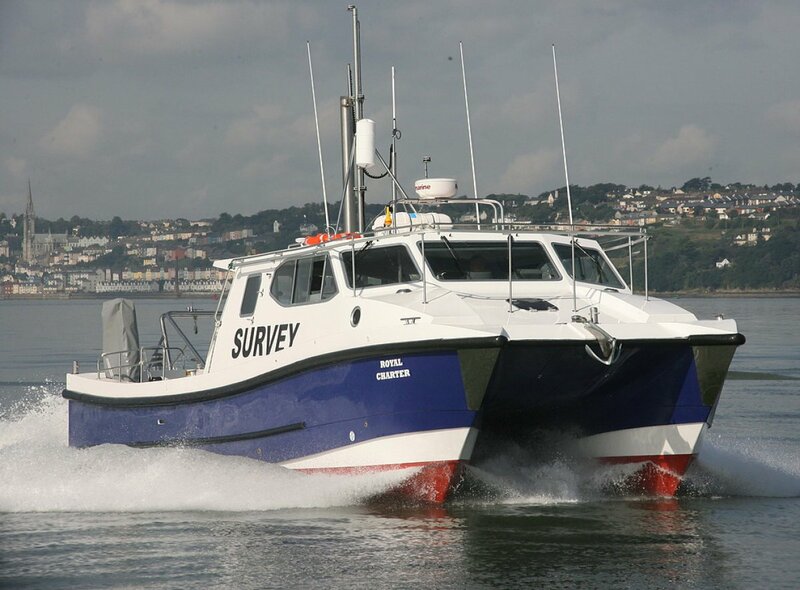 The vessel can also fitted with a 24,000btu air conditioning unit with high level outlets in the cabin roof for efficient cooling, The Wildcat is very quiet, only 70db being recorded in the cabin at 15kts, reducing to just 65db at 7kts survey speeds.